I think I have mentioned how much I love office supplies. I did a whole post here on my Pilot Metropolitan fountain pens. But that is really only half the story. What I write on is the other half of my nerdy little obsession. I am a bullet journaler. For those of you who don’t know what that is, a bullet journal is a free-form datebook that also has lists, information, pretty much anything you would jot down in your day to day life. The seminal bullet journal site is here but the beauty of a bullet journal is that it can be any format that works best for you. 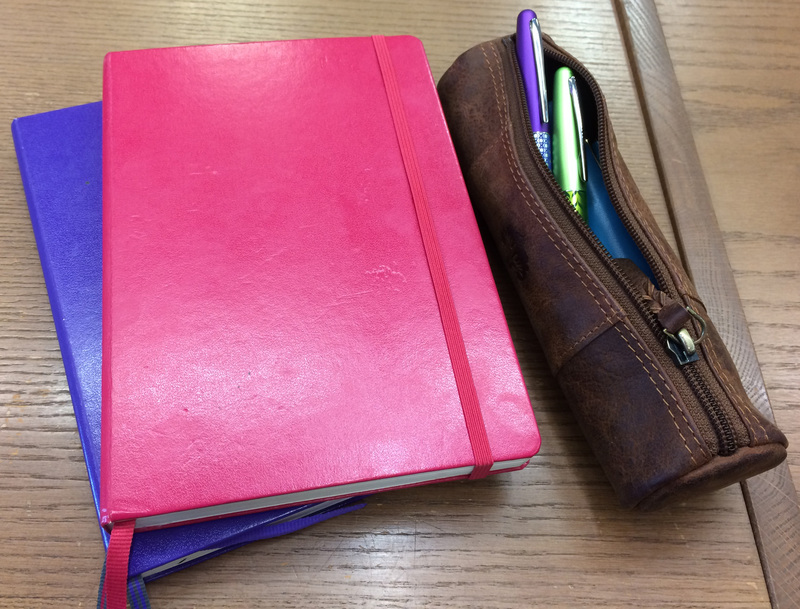 First, the notebooks. I looked around at a lot of different types and the one I found that is the best quality, hands down, is the Leuchturm 1917. The paper quality is outstanding, bleed through is almost non-existent. They also are sewn together and lay flat no matter what page. And you can get them with lined pages, dots or blank, so you can customize how you wish. At the end of November I buy two spanking new Leuchturm notebooks in complementary colors. One is dotted and will be my bullet journal, the other lined and my regular journal where I record thoughts and events. Then, for the month of December, I spend my time getting my calendar pages drawn in. I love having a calendar I can customize to suit my fancy and I really do slave over the pages. I usually make a photocopy of the two page spread first and then sketch it out in pencil before I start inking in the pages in the book. I told you I was a nerd. But the result? Pure, unadulterated, geek heaven. Not exactly jumping on the water and exercise, am I? After the calendar pages I also put in other things. I have been doing daily gratitude for over two years now. Every day I write down one good thing that happened. 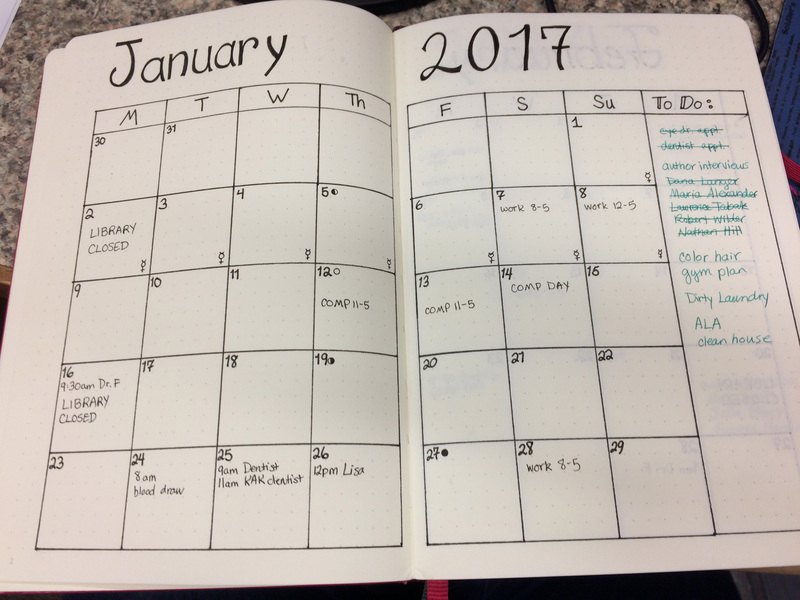 I also keep track of blog posts, author interviews, addresses, books read, and to do lists for each month. It’s very satisfying to have it all neatly tucked into a candy-colored book that fits in my purse. It’s lovely to have a row of them on my bookshelf at home as a record of my life. Do you bullet journal? What do you keep in yours? I started bullet journaling last July. I love it! I used a lt1917 for a while. Dot grid. Loved it. But I was spending too much time slaving away on my monthly and weekly pages. So I’ve switched to a Happy Planner by MAMBI. I’m able to add in my trackers and collections. It’s working great for me! 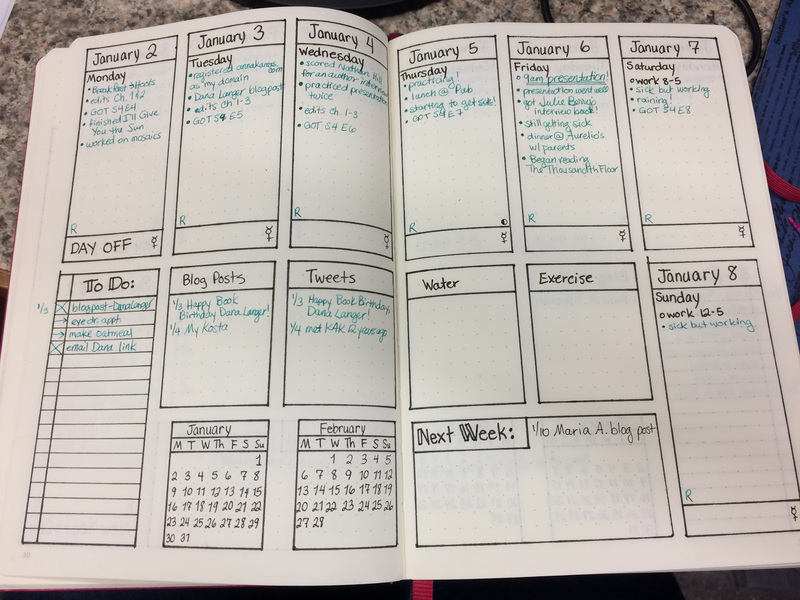 Thanks for sharing your pages and the concept of bullet journaling.